November 5, 2014, 11:19 AM · Much has been written about the controversial movie Blackfish, the 2013 film that vilified SeaWorld for use of captive orcas. Many in the theme park community have attacked the movie as a hit piece, while others in the anti-animal captivity community used it as a call to arms. But for all the discussion and passion that the movie generated, history tells us that this issue is as old as the industry itself. If told completely, this story shines a different kind of light on the culture of the times, and also on an iconic figure in American history. Once upon a time, a 110 years before Blackfish and Tilikum there was another movie, and an elephant named Topsy. Sometime around 1875, Topsy was smuggled as a baby out of Asia and brought into America to perform in the Forepaugh circus. 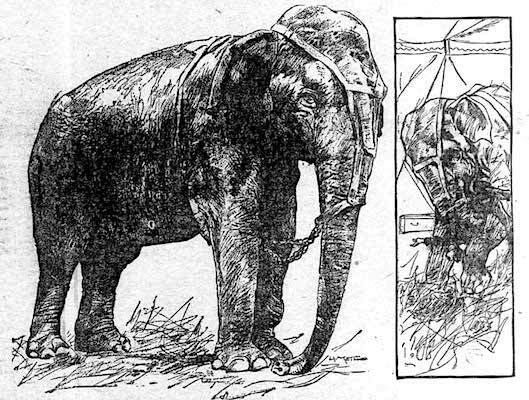 Billed as the first “American born elephant,” she became the star of the show. Like many circus performers at the time, she was subject to harsh treatment during training sessions. Trainers of the time were vicious towards the animals in their attempts to control them, prodding the elephants with sharp hooks between the eyes and in the head. Beatings, hot pokers, and even guns were also common methods of training. By most accounts, Topsy was one of the fan favorites. Behind the scenes though, she endured years of harsh treatment. Her crooked tail was a point of emphasis with promoters. In reality, it was the result of a particularly severe beating. Over the years, her temper became shorter and shorter, and she attacked several handlers and was reportedly responsible for the deaths of three of them. In 1902, one particular (alcoholic) trainer named James Fielding Blount foolishly met his end. After a night of heavy drinking, Blount went into the elephant tent and offered Topsy a drink of whiskey. Her refusal angered Blount, who reportedly then stuck a lit cigar on the tip of her trunk. He was then promptly thrown down and crushed. After this highly-publicized incident, Topsy was then sold to Coney Island amusement operator Paul Boynton. When Boynton sold his operation to the founders of Luna Park, Topsy and her trainer were part of the sale. Luna Park was under construction at the time, so for a brief time she was put to work hauling loads of building material. After a new site for the “Trip to the Moon” attraction was cleared, the workers tried, but simply couldn’t move the massive structure to its new location. Topsy was called upon to do the job. With the help of a few horses, she pushed the building nearly a mile to its new location. Police arrested one of her handlers that day after observing “excessive” use of a sharp object to prod the elephant. Her trainers reportedly kept a pitchfork handy. He was tried for animal cruelty but later was acquitted because the amount of prodding was deemed acceptable. Subsequent incidents and moments of aggression occurred, all under the watchful eye of the press. The final straw came when trainer Whitey Ault got drunk and decided to ride Topsy down Surf Avenue. When Whitey was arrested and taken to the station, Topsy followed them down the street and then tried to go into the police station behind them. Whitey was fired for this incident, leaving nobody on the staff that could handle Topsy. With costs of her care high and no one to take care of the elephant, Luna Park owners Thompson and Dundy tried to get rid of her. However, all the bad press over the past year had tarnished the elephant’s reputation. No zoo would take her, no show would have her. They tried to raffle her off, then to give her away for free, but had no success. After exhausting many options, the decision was then made to euthanize Topsy. 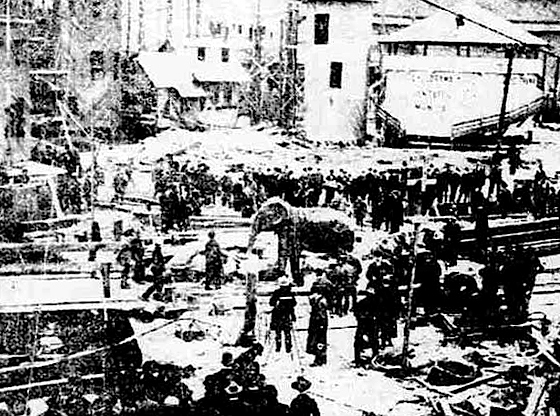 Killing a 10-foot tall, three-ton elephant in 1903 wasn’t a simple proposition, let alone doing so in a quick and humane way. They didn’t have a gun big enough to quickly do the job, and even though it had been done to other elephants before, the idea of hanging her was thrown out. The owners of Luna Park turned to inventor Thomas Edison, who by 1903 had fought and lost the “battle of the currents” for the electricity standard to be used in the United States. Edison’s direct current (DC) methods had been used extensively at first, but the more efficient alternating current (AC) method, invented by Nikola Tesla and backed by industrial giant George Westinghouse, had gained traction and was becoming the standard for distribution. Trying to keep his standard intact (and preservation of the royalties), Edison had engaged in a propaganda war, discouraging the use of AC by lobbying Congress, spreading false rumors and misinformation, and staging public demonstrations of its danger by electrocuting stray and unwanted animals. For a time his technicians were regularly dispatched for this matter, killing dogs and cats, and in some cases horses and cows. He commissioned a partner to develop the electric chair for the state of New York with AC current, even though he himself was reportedly an opponent of capital punishment. Edison’s “experience” with the matter and his standing as an authority on electricity prompted Thompson and Dundy to call. Even though the current war was over, he apparently for one reason or another couldn’t resist the opportunity to demonstrate the “dangers” of AC one more time…this time on the largest land animal in the world. Some say he was still fighting the war in his own mind, others say Edison still harbored a grudge from the loss and participated out of vindictiveness. Whichever the case, he signed on to do it, and he would document the whole thing with another one of his inventions, the movie camera. In another sign of the times, the ever-enterprising owners of Luna Park knew the attention the story had gotten, and they initially intended to charge admission for the public execution. The press coverage though had also attracted the attention of the SPCA, who flatly refused to allow that to happen. In turn, the admission fee idea was thrown out, but the public would still be allowed to watch. By this time, Topsy had been characterized in the press like a convicted killer condemned to death, and so the people came to watch. The execution date was set for January 4, 1903. A crowd of about thousand gathered in the courtyard of the half-finished Luna Park to witness the spectacle. Topsy’s old trainer Whitey Ault was offered a then handsome sum of $25 to help bring the elephant to her demise, but the saddened trainer turned it down, saying he wouldn’t do it for a thousand. With no qualified people to handle her, leading a very docile Topsy to the platform proved difficult. She wouldn’t cross the bridge to the middle of the lagoon. After technicians moved the wood and metal platform to her, she wouldn’t stand in place, then she shook off the electrodes that were hooked to her, and then refused to eat the cyanide laced carrots that were offered to her…almost as if she knew what was going on. After some coaxing, Topsy finally ate the carrots and the switch was thrown. She died almost instantly, and almost took one of the Edison technicians with her. He was also electrocuted when he threw the switch. Even though she had already been pronounced dead, workers tightened a noose around her neck for ten minutes to make sure. SPCA doctors on hand pronounced it as the most humane way to kill an animal they had ever seen, and Edison had his documentary. The film “Electrocuting An Elephant” depicted the first actual death on screen, and was seen by audiences across the country. A part of it remains intact online [warning: disturbing images] for the curious to view. Ultimately, the film did nothing to either advance his agenda or raise any kind of awareness for animal cruelty. Audiences of the time were simply more interested in the novelty of the motion picture, the spectacle, and being entertained. Perhaps some things haven’t really changed after all. Ultimately, Topsy’s story provides a bit of perspective on today’s state of affairs. Her story of a systematic life of abuse in the circus and the spectacle surrounding her death is the true epitome of animal cruelty. 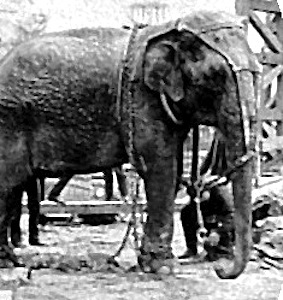 Topsy was not the only circus animal of the time to endure this kind of treatment, to be killed, or to kill a human being, but she was the most well known and well documented. Her brief role in the early theme park industry as well as American history makes the story worth telling, however horrible it may be. As for today, the debate continues. People may or may not agree with the use of marine animals in a theme park, but SeaWorld’s animal treatment methods, and its practices of conservation, animal rescue and rehabilitation, research, and education stand in stark contrast to the brutality of the Forepaugh circus and its contemporaries. For years there were reports of ghost sightings, but the story of Topsy largely disappeared for a long time. In recent years Topsy has reappeared in pop culture, namely the television show Bob’s Burgers and the 2009 video game Assassin’s Creed II. A book about Topsy and the early American circus written by Michael Daly was published in 2013. A memorial dedicated to her sits in the Coney Island museum. November 5, 2014 at 11:33 AM · Great article, Derek! Well written and extremely informative! November 5, 2014 at 3:09 PM · Sounds like Tesla was the real mastermind here, not Edison like we all learned in school. November 5, 2014 at 3:51 PM · Classic Oatmeal on Tesla vs. Edison. November 5, 2014 at 4:55 PM · The Tesla and Edison rivalry is portrayed in "The Prestige" movie. I didn't know Tesla was responsible for a contraption that makes replicas of magicians. Oh, that's how they do it. As for the animal cruelty of Edison, I wonder why we haven't destroyed his reputation yet. It seems like everyone gets a revisionist history makeover these days. November 5, 2014 at 7:05 PM · Some problems (well actually common myths) here. Tesla did not invent AC (that was known about before he was born) and AC power, and even the "War of Currents", were well under way before he got into the AC biz (with his 1888 induction motor patent). There is no evidence that Edison had anything to do with Topsy's electrocution. Michael Daly's book on the subject and the Rutgers Edison archive point out that the means of execution were decided by Thompson and Dundy, and the details handled by the park electrician and the local power company called "Edison" (that's Con-Ed, not Thomas Alva). Edison was a brand name at that point, so the power companies and even the film company that bore his name were not run by him. Edison was definitely never at Luna Park and it looks like the local story "Did you know in 1903 Edison (Con-Ed) electrocuted an elephant?" has morphed over the years into "In 1903 Thomas Alva Edison electrocuted an elephant". November 5, 2014 at 8:23 PM · Well writen article, and such a tragic tale. Poor Topsy. The concept of AC was around before Tesla, but Tesla is credited for perfecting the process and the equipment necessary to widely transmit it in the US. There can be debate as to when the war actually started, but Westinghouse licensing Tesla's technology and bringing it to market to compete was the true catalyst. Also, while this might not have been crystal clear, I don't recall saying that Edison was ever present for this event. The fact remains though that an Edison company carried out the execution, using means of execution invented by and marketed by Edison , and it was filmed and distributed by Edison's film company. Where in this chain is Edison not a party? I find it hard to believe that a guy who was a) highly active with his companies, and b) whose name is on the sign(s) bears no responsibility whatsoever. These are accounts of history, not necessarily designed to be a hit piece on Edison, but also not omitting his role. November 6, 2014 at 1:37 PM · Not to go back to myth but when it comes to Tesla, there is a lot of it. I have never seen a reliable history that characterized Tesla as the true catalyst of the War of Currents. The “War” got its start with Westinghouse building his first AC system - he did that in 1886 and was basing it on the patents of Károly Zipernowsky, Ottó Bláthy, Miksa Déri, Lucien Gaulard, John Dixon Gibbs, and the developmental work of William Stanley, Jr. By 1887 Westinghouse had more than half as many generating stations as Edison and Edison began his published diatribe against AC in February 1888. Tesla did not even show up on the scene until May 1888. Tesla's roll re:War of Currents was minimal, his induction motor patent really came into play in a later patent war after the current war was over. As for Edison’s roll with Topsy.... There is a world of difference between 1888 and 1903. In 1903 Edison was “not a party” because he was not a party, literally. The War of Currents ended with the backers of Edison Electric deciding they had to go AC, resulting in Edison being thrown out of his own electric company (down to a minority stock role) after the 1892 formation of General Electric. So he would not have been "highly active" in the world of power production in 1903, J. P. Morgan saw to that. The film company that bore his name was never run by him. In 1903 it was run by James H. White. To fill their kinetoscopes, Edison Manufacturing Company (the film company) had been shooting short films in Coney Island for 6 years before Topsy’s electrocution, Coney was s popular topic. It would have been odd if they didn’t shoot a well advertized spectacle like that. This all may boil down to Edison's name being on the sign(s). As Michael Daly and Rutgers point out the only "Edsion" in the newspaper accounts of this event were "Edsion electric workers" and the film of the event was signed "Thomas A. Edison". People don't understand that nether company was run by Thomas Alva Edison. November 7, 2014 at 2:33 PM · Derek Potter's story was very interesting as well as disturbing. I found Robert Ogen's myth busting story very informative and interesting. It is funny how the facts about anything are often skewed as time goes by.